The Penang General Hospital is the main public hospital in the city of George Town in Penang, Malaysia. The largest public hospital in Penang, it also serves as the reference hospital within northern Malaysia. The hospital had its origins as a medical centre founded in 1854 for the poor and opium addicts. The hospital land was given to the British Malaya government in 1882 for them to construct a hospital. In 1930, the nurse dormitory was constructed. In 1935, block A and block C of the hospital were constructed. In 1939, the maternity hospital was constructed. In 1989, the central administration center blocks were constructed. ^ "Penang to have first-ever school in hospital". NST Online. 2016-09-05. Retrieved 2017-03-23. ^ "Penang General Hospital - Georgetown.my". georgetown.my. Retrieved 2017-05-17. ^ "Sejarah" (in Malay). Jabatan Kesihatan Negeri Pulau Pinang, Kementerian Kesihatan Malaysia. Retrieved 26 October 2016. 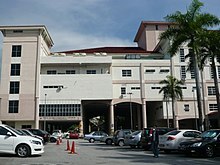 Wikimedia Commons has media related to Penang General Hospital. This article about a Malaysian building or structure is a stub. You can help Wikipedia by expanding it. This page was last edited on 5 January 2019, at 05:27 (UTC).